As a boy, Yuji Onuma won a contest to create the town slogan for Futaba, Japan. His phrase -- "Atomic power: energy for a bright future" -- was enshrined on an archway over the town's main street. But after the Fukushima nuclear accident in 2011, Onuma -- like many in Japan -- has turned against what he used to champion. Here, he stands in front of the archway holding a banner that modifies his slogan as statements opposing nuclear energy. The partial meltdown at Three Mile Island nuclear power plant in central Pennsylvania 40 years ago in March did not lead to large releases of radiation, but it helped turn public opinion away from nuclear energy. In Japan, an even more catastrophic nuclear disaster occurred eight years ago this month. And like many Pennsylvanians, the Japanese have largely turned against nuclear. The earthquake, tsunami and nuclear meltdown is known in Japan as simply “March 11.” And everyone knows where they were on March 11, 2011. 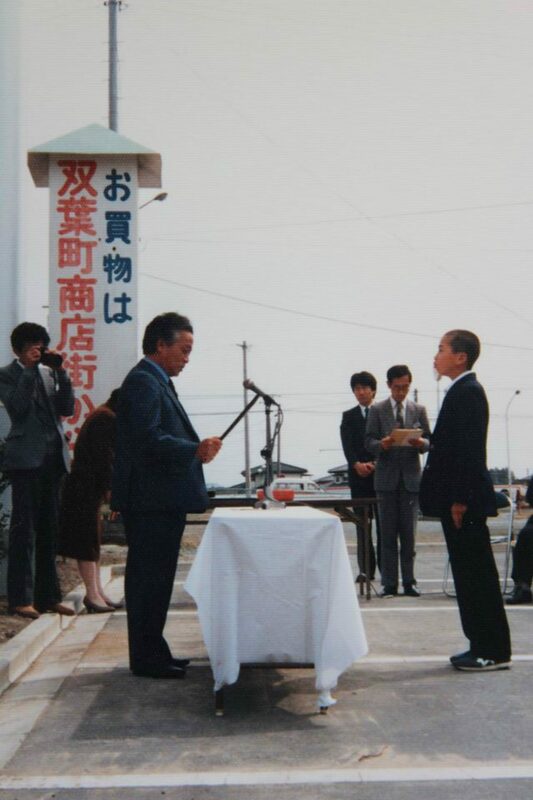 As a 12-year-old, Yuji Onuma, right, receives an award from the mayor of Futaba, Japan, because Onuma won a contest for the town slogan. He now regrets his slogan, which exalted nuclear power. Yuji Onuma was in the town of Futaba, where he grew up and was living with his wife, who was pregnant with their first child. Their home was about 3 or 4 kilometers from the Daiichi nuclear power plant. But right now, he’s living away from the coast in another prefecture, and he says he wants to settle in a town that is about as far away from any of Japan’s 54 nuclear power plants as he can possibly be. “Atomic power: energy for a bright future” became the slogan on an archway over Futaba’s main street. Onuma didn’t work in the plant, but he made his living off of it. He had several houses that he rented to workers. The houses have all been demolished. In total, an estimated 20,000 people died from the earthquake and tsunami, which ravaged the northeast coastal region of Japan. The giant waves reached above 30 feet in some places. The tsunami led to a meltdown at the Daiichi plant, operated by the Tokyo Electric and Power Company, in Futaba, Fukushima Prefecture. Power outages, and failures in the cooling systems, caused a partial meltdown. A report later blamed the company for not preparing for the accident, which they knew could occur, and not having proper evacuation plans in place. Hiroshi Miura was a rice farmer who fled the radioactive fallout from the Daiichi nuclear accident. Now, his fields are filled with solar panels. Hiroshi Miura was one of about 154,000 people who fled the radioactive fallout. In total, 470,000 people evacuated due to the earthquake and tsunami. Many, like Miura, never returned to their original homes. “We had nothing in our hands, we just ran away,” he said through a translator. 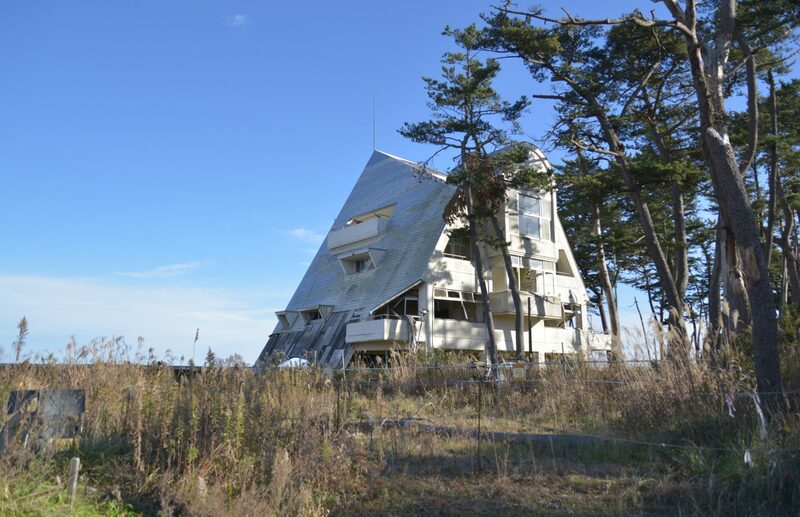 An abandoned coastal home close to the Daiichi nuclear power plant in Fukushima Prefecture, Japan. Even today, eight years later, the area where his house once stood is littered with debris, and full of trees killed by the force of the waves and the saltwater. Miura is a rice farmer who lived and farmed in Soma, along the Pacific coast in Fukushima Prefecture. That’s where the earthquake and tsunami destroyed his home. It killed 68 people in his neighborhood. Pointing up to a nearby cliff, he says more than a thousand years ago, when researchers believe the last tsunami hit the area, a shrine had been built in the safest place. Today, instead of rice, Miura’s fields are covered with solar panels. Like a lot of farmers near the plant, he says he can make the same amount of money using his land as a solar field as he can growing rice. In much of the area, the soil is still contaminated, and some consumers are wary of buying rice that originates in the region. Clearing land for solar panels in Fukushima Prefecture, near the Daiichi nuclear power plant. Near his land, workers are building a sea wall to protect the area from future tsunamis. 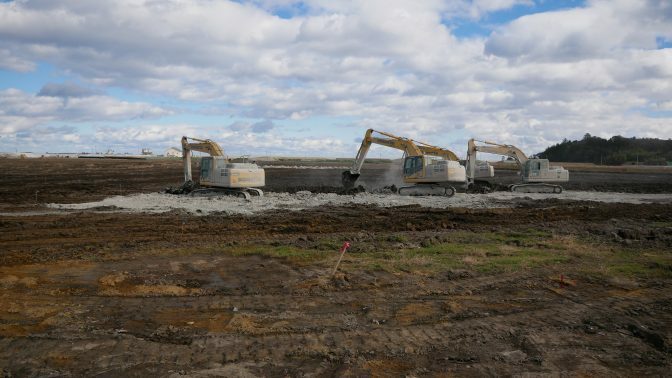 They are also removing contaminated soil, bagging it in white plastic, and stacking it in fields along the nearby highway, where it is expected to remain for decades. Miura’s former home was just 12 kilometers from the Daiichi nuclear power plant. Like a lot of people in Japan today, Miura opposes all nuclear energy. “The age of nuclear power is over,” he said. After radiation was released from the Daiichi plant, much of it drifted westward, into the mountains. 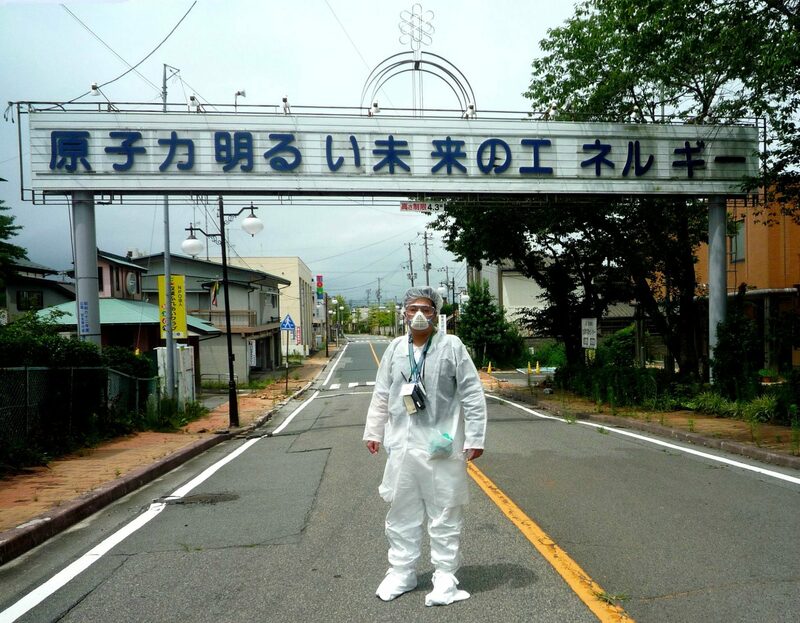 That area remains part of the “exclusion zone,” where the atmospheric radiation is still too high for humans to live. Signs warn drivers not to linger, and motorcycles are forbidden. A drive through the area reveals the post-Fukushima landscape: Abandoned homes nestled in red ceder forests. Toys lie scattered among high weeds. Metal gates with warning signs block access to driveways or small roads. Digital billboards display the amount of radiation that remains. 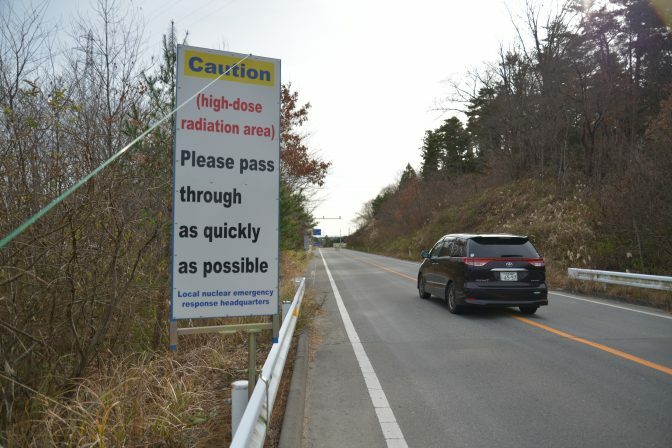 A road sign warns drivers of the hazards of continued radiation. At a roadside rest stop, people who have recently moved back say they’re sad that few people with children are willing to return. Although Yuji Onuma has regrets about the slogan he created, he fought the town officials, who planned to demolish it. 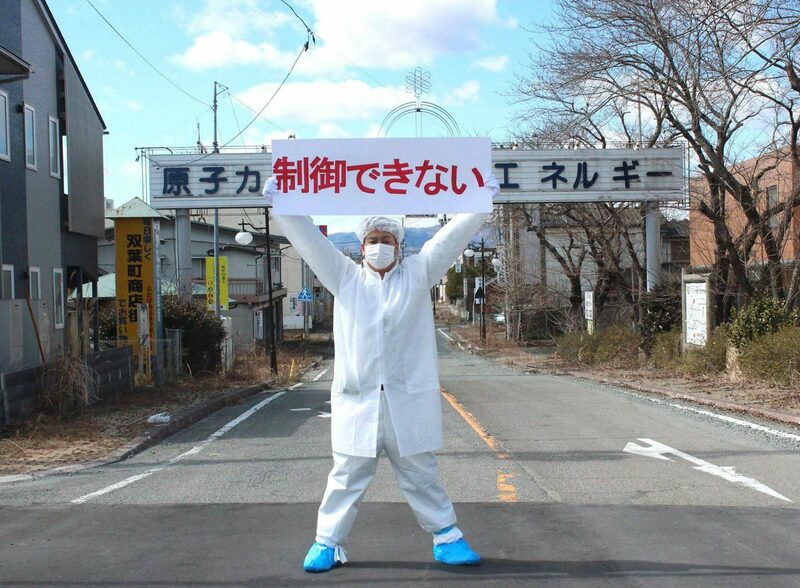 He created a petition, but ultimately the town removed the steel sign, which had been paid for by TEPCO. 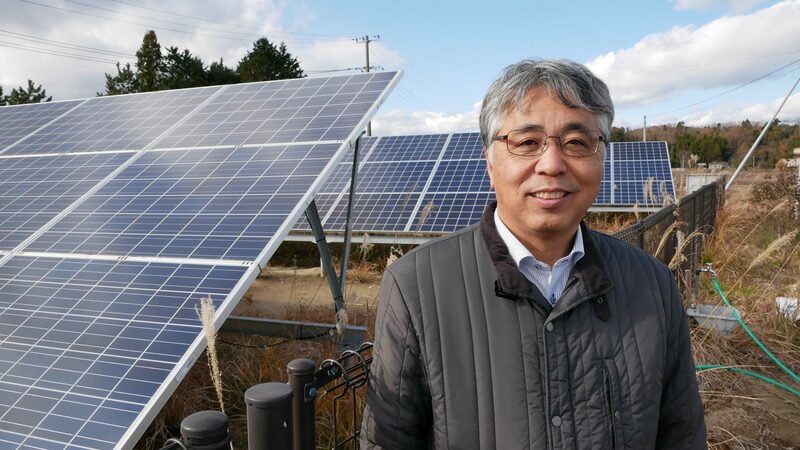 Onuma is now committed to renewable energy. He has a new business promoting solar panels, which he has installed on his own house. He wants his young sons, born after the accident, to live in a nuclear free world. Immediately after the accident, Japan shut down all its nuclear plants, which had provided 30 percent of the nation’s energy. Natural gas imports increased. Although nuclear power remains unpopular, the government supports atomic energy, and says it needs nuclear to provide at least 20 percent of the nation’s energy needs if it is going to cut carbon emissions enough to comply with the Paris Climate Accords. Nine reactors in five plants have gone back online. But Onuma says he won’t stop pushing for a complete conversion to renewable energy. Reporting for the story was made possible with a grant from the International Center for Journalists.